Not quite the update it could have been, but Pod Farm 2 remains a strong contender in the amp sim arena. Covers all the tonal bases adeptly. Huge range of amps, cabs and effects. Particularly adept at clean sounds. Pod Farm Elements are most welcome. Helpful, detailed GUI design. Some presets relatively noisy. No standalone mode with iLok version. No new models for v2. The lower section of Pod Farm 2's interface shows the signal path. Pod Farm launched a couple of years back as a replacement for Line 6's GearBox software. There are two versions - Pod Farm 2, which has 87 amps, cabs, stompboxes and studio effects, and Pod Farm 2 Platinum, which has a whopping 255. Both cater for guitar and bass players, and work in exactly the same way. It's a download-only product that requires either an iLok dongle or compatible Line 6 hardware such as a TonePort or Pod Studio. Of note is that the iLok version does not work as a standalone program, unlike most competing products. We tested Pod Farm 2 Platinum with an iLok, and once installed, you can either load up the full plug-in with its 'virtual room' of gear, or select from the list of 'Elements' plug-ins. The latter each offer a category of modules from the main plug-in (for example, amps, distortion, filters and so on) with a stripped down interface, to use like any other insert effect in your DAW. The interface of the main plug-in is ergonomically neat, with two main sections. The upper can contain a carousel of amps, preamps, cabs and effects (the Gear View); the chosen amp with virtual knobs for editing; the two-channel output mixer; a presets browser; MIDI/ automation assignments setup; or the excellent tuner. 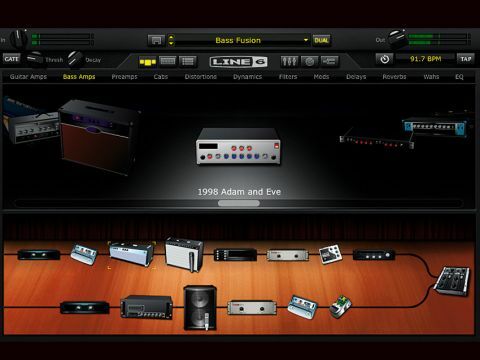 You can tab easily through these views using the buttons beside the Line 6 logo. The lower section shows the signal path of the modelled components you've selected. You can click on each component to enable/disable it, and edit its parameters in the upper section. Apart from the two main sections, there's a drop-down menu for presets, a noise gate, and level pots for both input and output. There are around 40 cab configurations available too. Pod Farm 2's strengths are wide-ranging, which is perhaps not surprising given the enormous quantity of gear that's been (unofficially) modelled, including amps from Fender, Vox, Marshall and Orange, and effects from Electro-Harmonix, MXR and Ibanez. All the usual suspects are here. The blues/rock tones are gritty and fairly realistic, as with many current amp sim plug-ins. Some presets are on the noisy side, with an undesirable yet authentic hiss like many real amps - luckily, the noise gate is efficient and takes care of the worst of it. The more saturated tones were still good but less convincing, and we preferred AmpliTube 3 for this. Of particular note are the modulation effects - the choruses are some of the best we've heard in software, with lots of high-end sparkle. While Guitar Rig 4 might be your first choice for way-out processing setups, Pod Farm 2 does 'workhorse' effects superbly. Clean tones are mostly very usable, and if that's your thing, it's a big selling point because most amp sims we've tried have their strengths in blues, rock and metal sounds. Pod Farm has just one dedicated EQ module, but EQ is always available from the various preamps, which include models of studio favourites like API and Neve pre/EQ setups - there's even an LA-2A. All of these audibly enhance your signal. The bass amps should not be overlooked either, and we particularly enjoyed the Amp 360, which gave a rich tone reminiscent of its Ampeg inspiration. The list of presets is vast and mostly named after well-known songs and gear. We found that most needed tweaking for dynamics, EQ and level - some presets are calibrated lower than others, as Line 6 points out in the manual. Pod Farm 2's Dual Tone feature allows your signal to be split into two and then processed independently in parallel, using up to 20 components in each chain. An A/B/Y switchbox routes your signal into 'Tone A' or 'Tone B', or both simultaneously. This mimics some high-end live rigs and gives potential for unusual hybrid sounds and fatter-sounding bespoke patches. The screen above shows the mixer view, with a channel for both paths of the split signal, and the dual signal path configured to play a blend of beefy rock tone and 'guitar synth'. The Dual Tone feature also has practical benefits, particularly if using Pod Farm 2 live. For example, if you have a 'dry' sound on Tone A and a delay-soaked setup on Tone B, when you switch from B back to A, the delay will decay naturally because you aren't muting the output, just redirecting the input. It's also worth noting that as of v2, you can have as many effects as will fit in each chain, and in any position (pre- or post-amp), which certainly opens a few sonic doors. Something to beware of is that switching between single and dual tones currently causes a jump in volume to maximum if your volume happens to be at zero to start with, which Line 6 cites as a known issue. New for Pod Farm 2 is MIDI control support, and we put this to the test with Line 6's own FBV Express MkII foot controller, although any standard MIDI controller will work. Setup possibilities are fairly detailed, with global controls like preset switching, tap tempo and so on available, as well as parameters of individual modules within a specific preset. You can also use MIDI to move between entries in a Setlist, these being a new feature for v2 that allow you to create a 'playlist' of presets, for instance, representing your band's set list. Line 6 has been peddling quality digital amp simulations for over a decade now, but these days there's some stiff competition. We're pleased to report that Pod Farm 2 holds up well and even betters some rivals in certain aspects. As an upgrade, it's disappointing that there aren't actually any new or improved modules here, so for those using v1, the decision to upgrade will depend on whether you see the value in features like Elements and the improved routing. On its own merits, though, Pod Farm 2 is a highly versatile plug-in with much to offer.